The Bible tells us 365 times to not fear, so God has got to be pretty serious about that, but in moments of weakness we tend to forget how persistent he is. I’m 25 years old with hip pain that’s preparing me to need a hip replacement much earlier than normal. I’m headed into my second hip MRI this afternoon, but this one is also an anthrogram. I have to be honest, I don’t remember the last time I was this nervous. They will be inserting multiple needles into my hip to numb the area before inserting a large needle full of dye. This dye is supposed to help visualize what’s going on in my hip, whether it’s a tear or a highly inflamed region. If its torn, surgery will be required to repair the torn area. If it’s not torn, we continue working on improving mobility, stretching, weight lifting, and will continue avoiding cardio until further notice. I’ve been anxious researching the pain to be expected all day, with sweaty palms and an anxious tummy. I keep reminding myself how direct and repetitive God is about fear. If you have a free second in your morning today, please send a prayer up for me. Pray for a lower level of anxiety and the best results we can ask for, which is no tear. I think, like most people, failing is something that scares me. Its frustrating, disappointing, disheartening and discouraging. It can make you feel down on yourself, and depressed. And it can make you feel like you’ve let yourself, as well as others, down. I realized today while logging on to my graduate school program that I am in my last semester to get my grades up before I am academically discharged from my program. In english, that means kicked out. I knew it was possible, but never did I think it would happen to me. My program is my dream. To be a nutritionist. To teach people all about food, and how it can hurt and harm, or heal and help you. How vitamins can change the way your body accepts and rejects food. The importance of physical activity, through both strength training and cardio exercises. The dream was to open a yoga studio where my nutrition practice funded the studio so that yoga could be more affordable for everyone who wants to practice. Its incredibly hard to not feel like I’m watching my dream fade away. 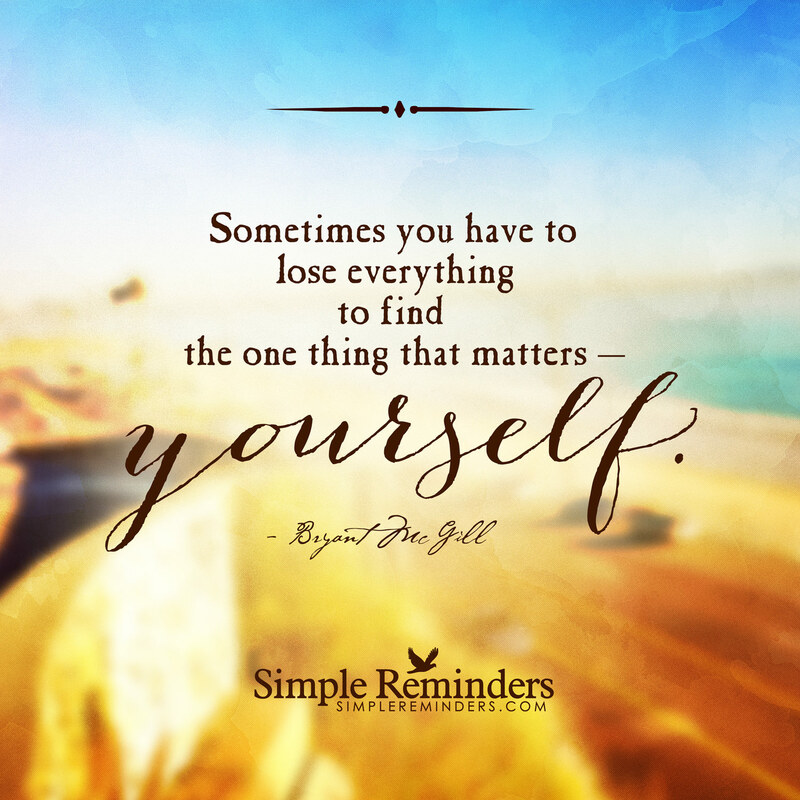 And I immediately go to that saying, you have to lose everything before you can really find yourself. 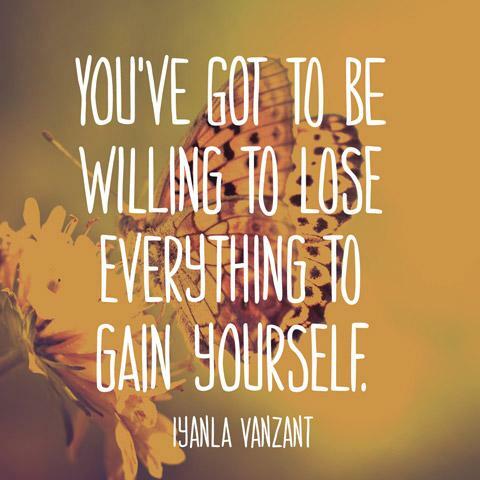 Or you have to lose it all in order to gain everything. I have always believe that the more you talk about something, and put the idea into the universe, the more likely you are to fulfill that dream. Which is exactly why everyone and their mother knows that I’m in graduate school. And that I want to open a yoga studio. And obviously be this world renowned yogi that travels and teaches. Like Yogagirl. 🙂 What she does is the dream, truly. But when I’m realistic, opening the studio and teaching people about good food was more than enough. I never would have thought I was going to have to step out of my program so that I didn’t have to get kicked out. Its embarrassing. Something that SO many people know about is ending. And I have no control over it because I did my best. With a full time job, I tried to add a masters program. I really am embarrassed, because I never thought it would happen to me. Never would I have thought that I would be worried about losing my job because of a move cross country. Never would I have thought that at 24 I would be single again, in this big and terrifying world. Never would I have thought that I would lose the dream before I created a new one. I never thought I would have to lose it all before I’d find everything, which I’m praying is coming. The Bible tells us 365 times “Do not fear”. 365 times. That is literally a daily reminder to not be scared. To not worry and to have hope in the plan that is bigger than I am. For someone who has always, and I mean always, had a plan I have never felt so humbled at the idea that I have no idea what is next in my life. I have no idea what the dream is now. And honestly, it could be on hold for a few years at most when I reapply to my masters and finish in 5 years. Or I get my personal training cert and go that direction. Or maybe I just work at an established yoga studio, rather than creating my own. Or maybe I develop a new dream. All I know is that I have never really and truly given my whole life, dreams and all, to God for Him to do with as he will. But in the last 3 months, He has proven to me that I don’t need any of the things that were in my life previously. I don’t need the man that was never going to make me a wife and a mother. I don’t need the masters program that I was so openly proud to have (which may have been my problem. Maybe I was too proud.) I don’t need the job that pays my bills, now my student loans, as well as my new car payment, and the food for my golden doodle. I don’t need to worry about the things I have no control over, like my pup eating a cat toy and providing me with $6,000 of medical bills. (Thank the Lord for pet insurance.) And I don’t need the only city that I have ever lived in and the comfort and support that it has provided me. God, you are SO good. And through everything that you have thrown my way these last few months, I have never once questioned you. This alone is incredible, knowing everything else that life has thrown me, and how I always blamed You for it all. Maybe thats growth. Maybe its acceptance. But I think it’s faith. Faith in a plan bigger and better than I can imagine. The dream I had for myself was so big, and bold, and what You have for me is going to be even better. My only request is that I’m ready for it when You give it to me. Please God let me be ready. I am constantly in awe of You. and I surrender everything to You. Your love is so incredible, and I will keep focusing on the blessing you continue to pour out on me, even when I have no idea where I’m headed. Thank you God for keeping me in the palm of Your hand, even when I have no idea where I’m headed. Amen.